Rob Souter. Photo via Mark Sydow’s Facebook page. Robert Souter, one of the finest drummers Australia has ever produced, is gone. Rob always played the music rather than the drums, and did so with consummate taste and an utterly infectious sense of groove. I first heard and met Rob in 1974 in Canberra. He came through from Sydney (where his collaborators had included Gary McDonald and singer Shirley Smith) to play adventurous jazz-based music with his old friend Mitchell Burns, an exceptional saxophonist. While in Canberra he met his future wife, Fenella, with whom I was co-habiting in a group house. Soon enough Rob had moved in and I (who was six years Rob’s junior) had my young eyes opened to the previously unthinkable reality of a 7 am breakfast being beer with chillies and cheese on toast. Not only were Rob’s early-morning culinary habits on a foreign plane to mine, I swiftly discovered that he listened to music in a different way to me. I was already besotted with the stuff, but was nothing more than a keen listener and muddling guitarist. Where I was seduced by the clever and the virtuosic, Rob was hooked on soul, truth and groove. He didn’t just introduce me to many artists whose work would become pivotal in my life, he opened my ears to a different way of listening and a different set of priorities. These priorities carried through to his own playing, of course, with grooves being subtly embellished rather than fills being forcibly inserted. If we watched Countdown together he would enthuse about the way the simplest rock beat was being played; if we listened to jazz it would be the way, say, that Charlie Haden’s monumental bass fattened a groove. In the mid-1970s Rob and Fenella moved to Melbourne, where he fell in with some of the best players on that city’s rock scene, before a return to Canberra around late 1978. I remember one blazing gig from this period when he and Mitchell duetted on Ornette Coleman’s Dancing in Your Head. At this time, too, Rob became my first drum teacher, a role he pursued with much good humour and typical self-effacement. Then he and Fenella moved to Sydney in 1979, and before long he was in the Dynamic Hepnotics. When I moved to Balmain in early 1980 they became one of the bands I routinely followed on the live music scene. I watched them grow in popularity and assurance, always underpinned by those supremely understated grooves. Meanwhile Rob came with me the first time I ever interviewed someone as a music journalist, and I was thrilled when he let me sit in with a country band with which he was playing at the Strawberry Hills . The years rolled past and we saw each other only intermittently for large slabs of time. I remember a fun project he had with singer Gulliver Smith, and of course he had his dozen years with Slim Dusty, loving the fact that Slim toured by air rather than road, and often stayed in a better class of motel. Then there were the years with Mental As Anything, and most recently I heard him with the Pinks. That was a jolly reunion, and another chance to relish the unforced profundity of his playing. 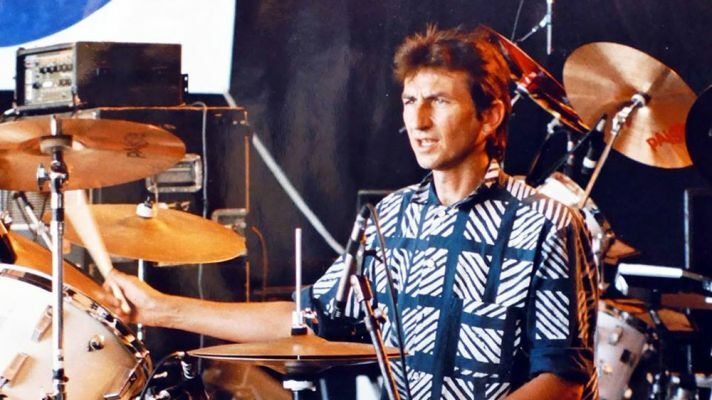 Rob would have been the first to acknowledge that as a person he had some rough edges in the early days, but he softened into a man of extraordinary warmth, and as a player – will let’s just say that drummers like Rob don’t come along very often.